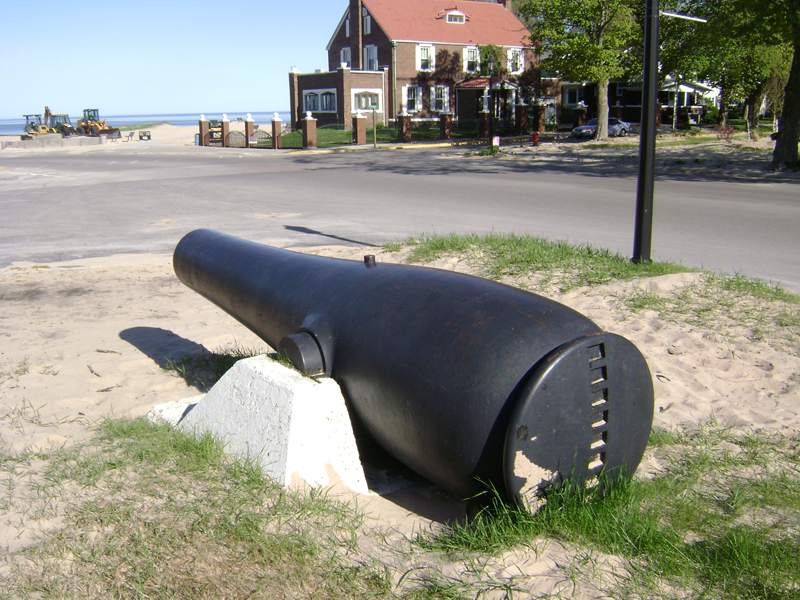 10 inch Rodman Gun (Columbiad) located at Frankfort’s Father Charlevoix Cannon Park, at the corner of Main & Michigan. This was one of the last 10 inch Rodman Guns cast. The Frankfort gun was the No. 81 Rodman cast at the Fort Pitt Pennsylvania foundry in 1868. It has a weight of 14,930 pounds and was inspected and accepted in to U.S. service by C.F.K. At this time C.F.K. is unknown and is a post-Civil War inspector. This type and size of columbiads were first cast in 1861. The 10 inch Rodman’s were designed for seacoast defense forts and most likely were never fired in anger. 1,301 10 inch Rodman Guns were cast with only 99 known to still exist, three of which are known to be in Michigan. They had a powder charge of 15lb & fired a 128 pound shot or a 102 pound shell. The shell had a range of 4,836 yards at 30 degree elevation.